Based on reviews from 3,026 experts and 414,942 users. Learn how our rankings work or see our guide to black running shoes. Updated Apr 2019. Black is the darkest color. It is the commonly used color for printing documents, newspapers and books, newspapers. Black is the result of the complete absorption or absence of visible light. Visible light is a form of EM or electromagnetic radiation that is defined as the wavelengths visible to the human eyes. Black is an achromatic color. Black and white are the colors often used to describe opposite things. Some examples are good and evil, truth and ignorance and the Dark Ages versus Age of Enlightenment. It is literally considered as a color without hue. Black represents darkness while white symbolizes light. Color psychology is defined as the study of hues that are determinants of human behavior. Color has long been used to create feelings of spaciousness and coziness. Black is a color that has different meaning and connotations. The meaning of color black is protection and mystery. It can be seen as threatening or mournful, but, like all the other colors, it has negative and positive aspects. Black is usually associated with power, mystery, evil and elegance. Color psychology is also widely used in fashion, marketing and branding. This is a color that is considered to be quite simple but elegant at the same time. A black running shoe, bag, purse, and outfit can be seen as more fancy than a colorful one. It’s a color used for special occasions to show sophistication and elegance. Many designers see color as an important part of fashion because color can be used to influence one's feelings, perceptions, and emotions. Black and gray are the two colors that can go with anything. It can go well with yellow, blue, royal purple, orange blue, emerald green, magenta, blue yellow, red emerald, green, purple chartreuse, yellow-green, and all the other colors that you can think of. Here are the five popular black running shoes best for road running. This list is based on RunRepeat's popularity score as of August 2018. Nike Air Zoom Pegasus 35. Many people loved the Nike Air Zoom Pegasus 35. A lot of them welcomed the engineered mesh, underfoot comfort and the color schemes in a positive way. It utilizes a design that accommodates runners who have a neutral foot mechanism. Flywire cables are used in the making of the shoe to provide an agreeable and secure fit. Adidas Ultra Boost. Adidas hypes the Adidas Ultra Boost as "one of the best running shoe ever.” The footwear received a lot of praise for its midsole responsiveness, durability and appealing look. While wearing the shoe, many runners were able to experience a more comfortable ride throughout their running sessions. The undoubtedly superior responsiveness of the Adidas Ultra Boost is the work of the TPU energy capsules. It is described to be 20% more responsive than any other Boost models. Nike Flex RN 2017. The Nike Flex RN 2017 is a road running shoe that is strategically made for those who are neutral pronators and supinators. It is designed to be lightweight in structure and follows the natural movement of the foot. A molded insole is added to support the curves of the underfoot. As a result, a more comfortable ride is experienced by the runner. Nike Epic React Flyknit. This running shoe is said to provide a high level of comfort that lasts a long time. The Nike Epic React Flyknit is flexible, responsive and durable. Its features and technologies make an excellent performance in walking, casual jogging, and road running activities. The shoe’s upper area is made up of a soft and secure Flyknit material that feels like a sock. With its upper construction, breathability is also encouraged which results in a healthier and fresher foot environment. Nike Downshifter 7. The Nike Downshifter 7 is a budget-friendly black running shoe for everyday use. It has a minimalistic design and that makes it wearable for several types of activities like walking, light workouts and running. The overall structure and design of the footwear were updated to give a more modern look and aesthetic. The upper textile was redesigned to promote proper ventilation. This is essential in maintaining the breathability of the foot chamber. Below are the five popular black running shoes best for trail running. 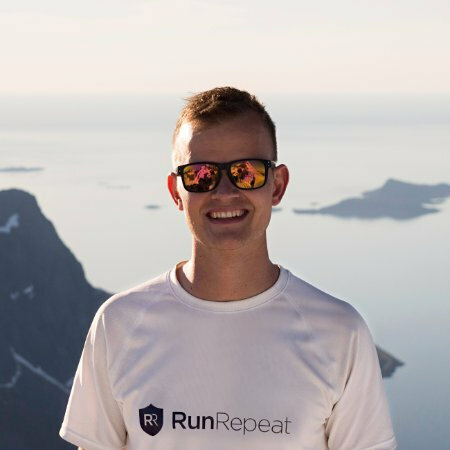 The information is based on RunRepeat's popularity rating as of August 2018. Salomon Speedcross 4. The outsole of the Salomon Speedcross 4 utilizes the Contagrip rubber. With the use of this material, the shoe provides excellent grip on grass, steep inclines, slippery surfaces, and loose gravel. Salomon’s unique SensiFit system and Quicklace work together to provide a more secure fit without compromising comfort. Asics Gel Venture 6. The Asics Gel Venture 6 fits true to size. The semi-curved shape of the footwear mimics the natural curvature of the human foot. Its soft cushioning aims to offer high levels of comfort during the running activities. Breathability is encouraged by the mesh upper. The Asics Gel Venture 6 is sure to provide a cooler and drier foot environment even during warm weather. With the utilization of this material, better inflow and outflow of air is provided. Asics Gel Sonoma 3. The Asics Gel Sonoma 3 is an updated version to the series of the Asics trail running shoes. The footwear is made for runners who have a neutral foot mechanism. It doesn’t have a bulky appearance, which is common in most trail running companions. The Asics Gel Sonoma 3 also features a variety of colorful designs that are visually appealing. The majority of the users admired its versatility, structure, and performance. Merrell Trail Glove 4. One of the notable changes to the 4th version of the Merrell Trail Glove is the tongue unit. The half burrito tongue is a continuation of the upper; it is not a separated unit. Because of this, a snugger fit is offered. Users can confidently run because of its aggressive Vibram TC5+ outsole. This lightweight rubber material of the Merrell Trail Glove 4 provides added durability, flexibility, and responsiveness on a wide variety of surfaces. Nike Air Zoom Terra Kiger 4. The Nike Air Zoom Terra Kiger 4 is a neutral trail running shoe that provides the right blend of reliable traction, comfort, and durability. The majority of the users lauded the updates that were made for this version. One of the changes made is the improved Flymesh upper. This component of the Nike Air Zoom Terra Kiger 4 aims to continue to deliver lightweight support and breathable coverage. It features the gusseted tongue design that holds the foot securely. With all the technologies and features that are integrated into the shoe, there is no doubt that the user will have an enjoyable running experience without sacrificing the value of the money they have invested for this black running shoe. In searching for the best black running shoes for men and women, the price is one of the most important things that a runner is considering. Here are some of the affordable shoes based on RR's popularity rating as of August 2018. Reebok Express Runner. The Reebok Express Runner is created for the road. It is ideal for neutral pronators who want to take their running activities to the next level. This shoe accommodates runners who have medium to high arches. With the utilization of the IMEVA foam in the midsole are, the shoe offers a lightweight cushioning without compromising its responsiveness. The basic rubber outsole is integrated into the Reebok Express Runner. This material provides added durability. It also aims to deliver a more efficient ride. Reebok Ahary Runner. The Reebok Ahary Runner has made a lot of purchasers happy and satisfied because of its fantastic design, fit and support. It is a road running footwear that is best for those who are neutral pronators. The camouflage engineered mesh upper is used in the making of the Reebok Ahary Runner. Aside from its excellent construction, the shoe also delivers the right blend of style and comfort. While others have issues with the black running shoe's width and size, others still lauded the footwear's performance. The Reebok Ahary Runner is a good deal for those who are in search of a durable, comfortable, simple yet affordable running shoe. Puma Flexracer. The mesh of the Puma Flexracer improves the natural running principle. Without sacrificing the natural stride of the runner, it holds the foot securely. The material's breathability is sure to let the runner experience a sweat-free and cooler foot chamber. It features the full-contact rubber that provides the right amount of traction on different paved surfaces. Along with several grooves, flexibility is encouraged. Under Armour Micro G Pursuit. The Under Armour Micro G Pursuit is perceived to be a neutral shoe that is agreeable for the roads. It features the full-length rubber layer in the outsole area. This component of the shoe aims to protect the midsole unit against the hazardous nature of the roads. Above the primary midsole lies a sock liner that is made of ethylene vinyl acetate or EVA. This material aims to add more underfoot cushioning. As a result, additional comfort is provided to the foot. New Balance Cypher Run. A mid-cut road running shoe, the New Balance Cypher Run, is constructed with a lightweight upper area. With the use of the bootie construction, it works well in wrapping the foot securely. It ensures a snugger fit throughout the running session. A more responsive and softer cushioning are offered by the EVA midsole. This material aims to withstand the challenges and pressure that the runner will encounter throughout the session. When buying a black running shoe, the brand, design, style, and price are the things that one should consider. Below is the list of affordable shoes based on RR's rating as of August 2018. Merrell Trail Crusher. The platform of the Merrell Trail Crusher utilizes the M-Select GRIP. This technology is essential in providing the the right amount of traction that the runner needed on wet and dry surfaces. Flex grooves are integrated into the black running shoe for a more efficient toe-off phase. To absorb impact shock, the Merrell air cushion is incorporated into the footwear. The Merrell Trail Crusher is sure to gain praise because of its appealing looks, versatility, quality, and comfortable coverage. New Balance 510 v4. The outsole area of the New Balance 510 v4 utilizes the rubber compound. This wear-resistant rubber protects the entire platform against the abrasive materials that can be found on different types of surfaces. Holding the foot in place is the responsibility of the plush tongue and collar. These materials are vital in preventing possible shoe removal during the running session. To provide a cooler and drier interior foot environment, the breathable mesh is used in the shoe. Added comfort is encouraged because of the footwear's well-constructed upper. Adidas Terrex Agravic. The Adidas Terrex Agravic is a trail running shoe that’s purposely created for runners who want to experience a hassle-free ride. It features the Continental rubber that aims to deliver strong traction. This component of the footwear offers excellent surface control when tackling challenging trails. Many runners were happy because of its modern look. In terms of the visual appeal of the shoe, several color options are provided for buyers to choose from. Saucony Caliber TR. The stylish design yet flexible and sturdy insole of the Saucony Caliber TR was appreciated by a lot of runners. This sock liner is called the REACR2U memory foam. This material is responsible for the additional underfoot protection and cushioning of the platform. The rubber outsole, together with the aggressive lugs, offers reliable traction on loose and wet surfaces. The Saucony Caliber TR utilizes the Lace-up closure system. This component of the platform is essential in providing a more individualized fit to the user. Runners will be able to run efficiently without having to worry about unexpected shoe removal. New Balance Vazee Summit v2. The New Balance Vazee Summit v2 is made with notable features and technologies that are needed for short and long-distance runs and walks. It offers the right blend of durability and comfort in every running session. The Hydrohesion Rubber is integrated into the outsole of the New Balance Vazee Summit v2. The primary focus of this material is to deliver the maximum amount of traction on a variety of surfaces. For a more responsive ride, the full-length REVlite foam is added in the midsole area of the shoe. As a result, soft underfoot cushioning is experienced by the runner throughout the activity. Cuff your jeans. When planning to wear your black running shoes with skirts or pants, you have to remember to show them off. It is important that you make a statement out of your outfit without compromising your style and personality. The best way to do this is to make your ankle bone visible. How to this? Cut, hem or cuff your pants to have the perfect length. By doing this, your black running shoes become very visible to the human eye. Go for an attractive color of clothes. A good pair of black running shoes with a solid color of clothes never goes out of style. You can combine these attractive and bright colors and achieve that iconic, modern or old-school look without being out of style. One good combination is cuffed white jeans, a colorful blouse, and a black running shoe. This will create a relaxing, fashionable and chic look. Avoid wearing socks. This one can be hard. Some of us are uncomfortable wearing a running shoe without a sock. For the sake of fashion and style, you have to avoid showing-off your socks especially if you are wearing a skirt or cuffed jeans. If you can't tolerate wearing a sock, choose pants that will cover your socks. Wear a low-rider sock. If you're not used to wearing socks with your black running shoes, choose a low rider sock. By doing this, you are comfortable all throughout your everyday activity. Be careful when wearing your black running shoes with a skirt or dress. Admit it, sometimes we can be playful with the types of clothes that we wear. If you want to wear a dress or a skirt, make sure that the length is above the knee. If you plan to wear long skirts, pair it with a low-rider sock. We can always try the old look but make sure to incorporate the modernize style. Remember, it's not the type of clothes that we wear, but how we carry those clothes while we're wearing it. Is it best to use a black running shoe than bright colored shoes? One advantage of wearing a black running shoe is you can use it with any other color of the outfit. You can wear them at work with your skirt. You can wear them to the shops with your jeans or wear them to the gym with your workout clothes. They’re the ultimate all-around black running shoe that provides comfort and style. Is it safe to use my black running shoe during night time runs? Because of its dark color, it's not safe to use a black running shoe at night. If you're planning to wear a black running shoe, make sure that it has reflective details. These reflective details will make you visible at low-light conditions. Can I wash a black running shoe on a regular basis? When taking care of a black running shoe, it is important to wash it regularly. For personal hygiene purposes, you have to clean it properly. Just use a mild soap, little warm water, and toothbrush in cleaning the footwear. Don't soak the shoe for a long time to prevent discoloration. When drying the black running shoe, dry the shoe naturally. It takes 12 hours to totally dry a shoe. You can also stuff the inside part of the shoe with newspaper or cloth to absorb the moisture. Which is best for trail running? A black running shoe or white? The color of the shoe does not necessarily affect its performance and quality. But, for cleaning purposes, it's easier to clean a black running shoe when compared to white. During the running activities in the trails, the runner might step on muds, dirt and all the other things that will make the footwear dirty. So, a black running shoe is preferred by many users than white. I wear some of my black running shoes on casual days, can I wear it with jeans? A running shoe is not exclusive for running purposes only. It can also be worn on casual days and everyday use. Black running shoes can be paired with jeans and skirts. Always keep in mind that as long as the user knows how to carry this outfit with style and fashion, he/she can freely wear this even when not running on trails. What's the most affordable black running shoe in the market to-date? Based on RunRpeat, as of August 2018, the Reebok Express Runner is one of the affordable shoes for road running while the Merrell Trail Crusher for trail running.